There’s a boat trip (Monday to Thursday) that can take you snorkeling in the reefs surrounding the “Cayos de Villa Clara”. Departure is at 1:30 pm daily (back around 3:30 pm), the cost is 31 CUC per person (2017). This tour includes the transfer (Hotel-Marina-Hotel), snorkeling gear, and non-alcoholic beverages. A minimum of 20 people is required, and the maximum is 75 people. The following excursions also include time for snorkeling in their program: Catamaran Crucero del Sol, Sea Tour, Boat Adventure and Caguanes Tour. This punta (point) is located at the western end of Cayo Santa Maria, near hotel Melia Buenavista. There are a many coral heads close to the beach. If you have fins, you can go further to explore a small coral island located about 200 meters from the beach. There are no spectacular coral formations but many types of fish can be seen there. The current can be a bit strong in this area; we suggest to avoid snorkeling when the sea is rough. 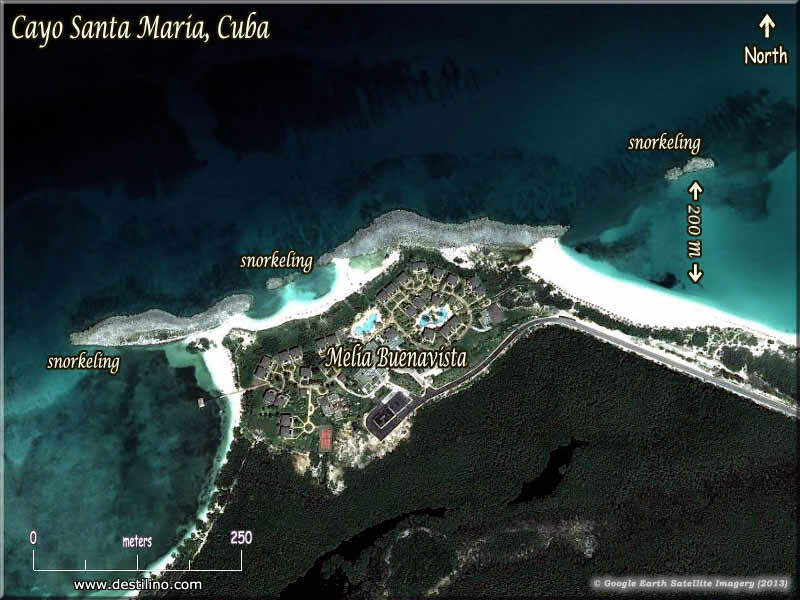 There are a few coral plates just west of hotel Sol Cayo Santa Maria, in front of its Clothing Optional beach. You can snorkel there without fins because these plates are very close to shore, you can even snorkel there “au natural”. In the east part of Cayo Santa Maria (Punta Piedra Movida, Lagunas del Este and Playa Perla Blanca), there are many rocks and small coral heads scattered here and there and close to the shoreline. We never tried yet snorkeling in this area but we suspect that it could be a nice spot. The hotels located in these sectors are: Golden Tulip Aguas Claras (formerly Eurostars), Labranda Cayo Santa Maria, Ocean Casa del Mar by H10 and Valentin Perla Blanca. Between the two beautiful beaches located in this cayo, Playa Ensenachos and Playa El Megano, there’s a short rocky section where many fishes and small coral heads can be seen very close to the beach. In front of the northern end of Playa El Megano there’s a large partially sunken boat which is lying on the sandbar not too far from the shoreline, it’s easily reachable if you have fins. The wreck has become a habitat for a wide variety of sea life. At the extremities of the beaches located on the northern coast of this cayo, there are rocky points. We never tried yet snorkeling in this area but we suspect that they could be nice spots. If you are interested about snorkeling in Cuba, we invite you to also visit our Neptune website. It contains a lot of information, underwater photos and videos about several Cuban destinations, and some other countries also.